Water-Methanol Injection Kit L6, V6 Turbochargerd, Supercharged Water-Methanol Injection Kit Jeep Wrangler V6, Water-Methanol Injection Kit Jeep Wrangler L6, Water-Methanol Injection Kit 08-up Dodge Challenger V6, Water-Methanol Injection Kit 06-up Dodge Charger V6, Water-Methanol Injection Kit 05-08 Dodge Magnum V6, [Nitrous Express 15136 Kit] - $1,019.99 : 3rd Strike Performance, Your Source for Late Model MOPAR Performance Parts and Accessories! 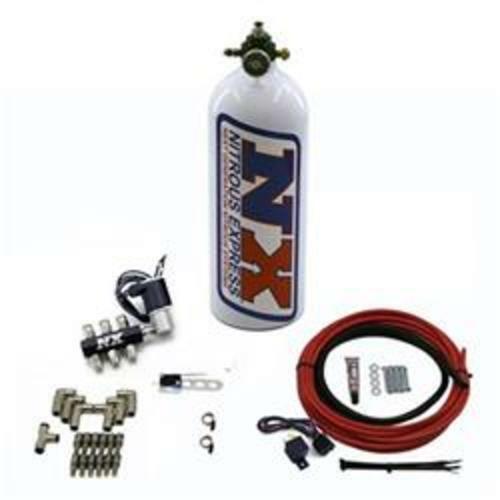 Get an extra boost of power from Nitrous Express pumpless direct port water methanol systems. They cool your intake temperatures to maximize engine performance by putting the water/methanol mixture directly into each intake runner. These systems include a pressurized reservoir, eliminating the need for an electric pump. The adjustable pressure regulator allows you to control the amount of water and methanol injected into the engine without switching nozzles. These systems include two solenoids, a billet aluminum distribution block, filtered nozzles, and nickel plated fittings.